​The slide show in the above header is comprised of photos taken at a Strathroy Vocal Federation, Wednesday night practice session as they practice for their 24th annual show entitled, "Songs From The Greats". Every annual show is our pride and joy and it is what we work towards producing each and every year. While on the subject of our annual show, we wish to acknowledge the services that were generously granted to The Strathroy Vocal Federation by the man pictured on the left. For each and all of our annual shows, Blake Hughes created, with his exceptional, artistic abilities, a stage background like the one shown with him. Blake has since retired from the Chapter and we indeed do miss him, but we wish him our best, with thanks for all he has done for us over the years. And, as of November 17th, 2018, the members of this chapter, as well as members in chapters all over Southern Ontario, are mourning the loss of the man in that video who said "Hi" after giving us the chance to hear his beautiful bass voice. BIG Jim Mcdougall will most certainly be missed, as he played such an important part in the starting and maintaining of the Strathroy Vocal Federation. 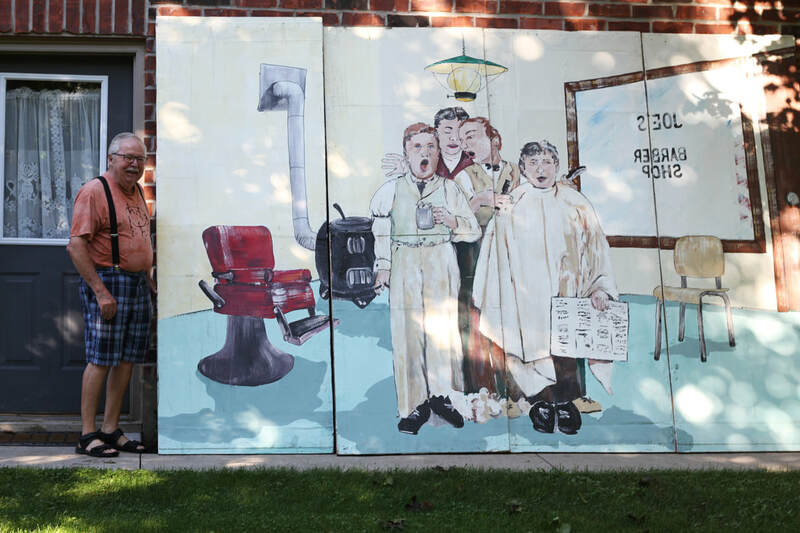 Jim spent most of his barbershopping years with London's Men of Accord, and Doug Petch, who is a member of the London chapter, and who has known BIG Jim from when he first started singing with them back in 1960, wrote a fantastic article entitled "Memories of BIG Jim". It was published in the December 2018 issue of the Men of Accord's newsletter called The Clipper and I ask that you click on either of the last two, highlighted links to be taken to the newsletter so that you can read Doug Petch's article, and thankyou Doug. ​Welcome to the official website of the Strathroy Vocal Federation. The Federation is a group of men both young and old, coming from Strathroy, Ontario and surrounding communities. We come together every Wednesday evening from 7:30 pm to 10:00 pm, at St. Andrew’s Presbyterian Church at the corner of Albert and Richmond Street in Strathroy, whether it be spring, summer, fall or winter.